YOU'RE LOOK SOOOO SOOOOO BEAUTIFULL ! Great skirt! Cool photos! I wouldn't mind more words at all, actually! che carina! mi piace la gonna!! Love this look. amazing shoes! Ta suknjaaaaaaaaaaaaa <3 ahh. odlicna je. I love the photo taken from the top!!!! Love the outfit! I really like it! You look amazing! I absolutely love that skirt! Thank you for visiting my blog, just followed you! Hope to see you back. Oh such a good outfit! lovely outfit, the skirt is simply perfect! I just found your blog and it's gorgeous! pictures are great and fabulous outfit! Love the skirt & how it can be worn in the daytime just as well. I need that skirt in my closet RIGHT NOW! Love love love it! AMAZING!! !SO CREATIVE AND COOL!THE PARROT IS AWESOME!!! SVAKA CAST ZA KREATIVNOST! !JAKO JEDINSTVENO!POZDRAV IZ KANADE!! Love the angles and light in these photos! waow.. awesome look.. i love the combination sequin and white.. love it.. btw, thank you for visiting and lovely comment on my blog.. I love the outfit! You are amazing! Perfect. You are very pretty and I really like your look :) Good luck. you look so gorgeous!! loving your skirt. I really love your sunglasses! You look so cool, skirt and shirt are amazing together! gorgeous ! u r so beautiful!! Love this outfit, it is gorgeous! Beautiful photos.I like your outfit, is very cool and the necklace is very original! Thanks for your comment :). Love the shirt, the shoes and glasses! So nice outfit! Love your shoes! Gorgeous! That parrot is so freakin cute too. Loving this outfit...you have such darling style, that necklace is awesome :) Following your blog! Thank you so much!!! You look fantastic. Where are your sunglasses from? you have an amazing blog, dear :D thnx for your comment! That sure is one flashy skirt. What a gorgeous outfit! Love the skirt! Love your outfit. 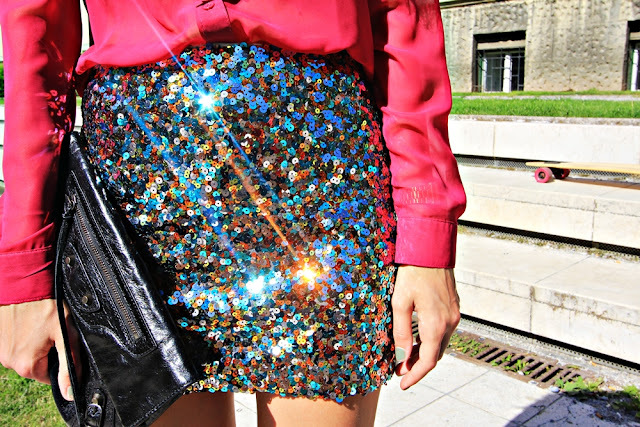 Amazing skirt!!! I love it so much, you have an amazing style! La blusa, la falda, los zapatos... TODO! un look 10, felicidades! S A V R S E N O! that skirt is so much fun and that necklace too! This is a glamorous take on a casual outfit. Suits you to perfection. love the bird necklace!!! and those heels! gorgeous look:) love your skirt! Odlične fotke!...a i cijeli look naravno! ja sma se zaljubila u cijeli outfit!!!!!!!! prosto savrseno!